This is a heads up for next year. I just got back from the annual 2 day University of VARA (Vintage Auto Racing Association) competition driving school, and it was a great event. Here are the key points. 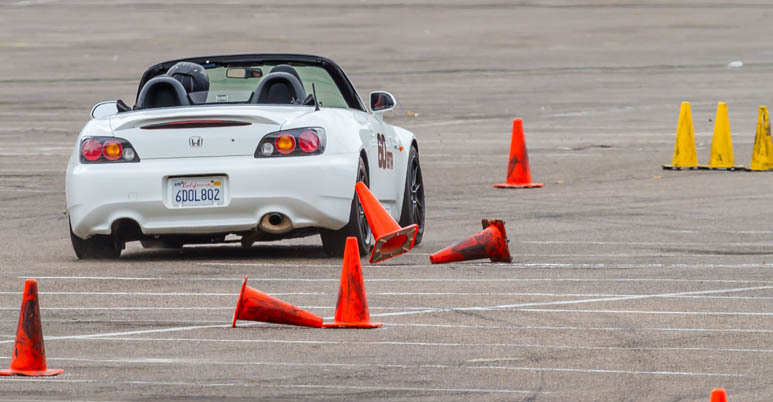 Buttonwillow, clockwise 14 track layout. They don't care whether your car is vintage or not for this school. But, it is totally cool to be on track chasing the vintage Jags, Triumphs, Ferraris, Alfas, Morgans, etc, not to mention the early 90's Winston Cup car. Approx 2 hours of track time each day, in 4 segments each day ranging from 25 to 50 minutes long. 12 to 15 cars on track at a time, so it was not crowded but there were people to chase. Divided into 4 skill groups, so you run with similarly skilled drivers. And they move folks between groups as needed based on what you show them. Passing on the straights only on Sat but the advanced group ran open passing on Sunday. Last session on Sunday was "practice" racing starts for the race prepared cars, which were really one lap races to a checkerd flag. Corners and safety crew well staffed. Strong safety emphasis, but they let you run whatever pace you're comfortable with. Pretty much unlimited access to the skid pad included. Good class room discussions on technique. Very well run and friendly event. Rental cars are available, 60's vintage British gear and modern race prepped Scions. This was my first track day like this, and most students were also fairly new to track events. It was very well managed for this. Speeds were reasonable, I saw 110 max in my Miata, Vettes maybe 130 on the back straight, and the runoff areas are wide and soft, (keep your wheels straight), so it was not intimidating and seemed about as safe as a track event can be. I don't think anyone bent a car. I'm going back next year.